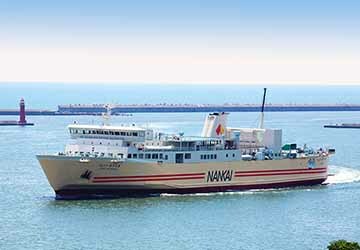 Nankai Ferry - View timetables, Compare and book ferry tickets at directferries.ie. 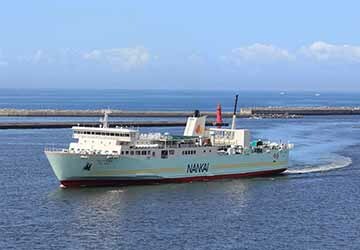 Nankai Ferry provide one of the most important transport links in the entirety of Japan, connecting Tokushima to Wakayama, a prefecture on the main island which is located fairly close to Osaka and its international airport. Part of the route’s appeal lies in the relatively short length of the crossing; lasting only two hours, the smooth sailing is much quicker than any land alternative. The operator themselves have two main ferries which are used frequently in the ferry route, both are capable of carrying up to 427 passengers and 39 vehicles at one time, holding the vehicles in the deck that stretches to 108 metres in length and 17.5 metres in width. The impressive length doesn’t deter the vessels from travelling at great speeds; once in full flow, both ships can travel at a speed of 21 knots. Due to the quick crossing, the facilities on board are fairly simplistic, though the layout and décor make for a comfortable ride; there are relaxing chairs to dose off whilst you sail, plenty of space to walk around the vicinity as well as food and drink on board to keep you well nourished. The simple amenities and setting, alongside the friendly and diligent staff, typically make for a very pleasant journey. Directferries.ie provides an impartial ferry comparison service allowing you to view numerous ferry company timetables and fares in one quick and easy search. Compare Nankai Ferry timetables and prices now with all alternative ferry operators before booking your ferry ticket.